To dip means ‘to immerse something quickly in a liquid’ and also ‘to scoop up.’ It also means ‘to go downward’ or ‘to decrease temporarily.’ In addition, to dip means ‘to lower something and then raise it again.’ A dip is the act of dipping and the substance in which something is dipped, especially when we talk about food. It’s also a temporary decrease in prices and a downward slope or movement. A dip is also a quick swim. As a slang term, a dip is a foolish person. Rachel dipped her hand into the bathwater to test the temperature. Edward dipped some soup out of the pan. Following rumors of financial problems, the value of the company's shares dipped. The soldier briefly dipped the flag. Patsy put out some dips and chips for her guests to eat while they waited for dinner. When you come to a dip in the road, take the turn on the right and our house will be straight in front of you. It's such a hot day; let's go for a dip to cool off. I can't believe you didn't know that Paris is the capital of France; you're such a dip! Dips are often used as appetizers in the US and UK. They are served with chips (in the UK, we tend to say “chips and dips,” even though we normally call “chips” crisps), breadsticks, or vegetable sticks. 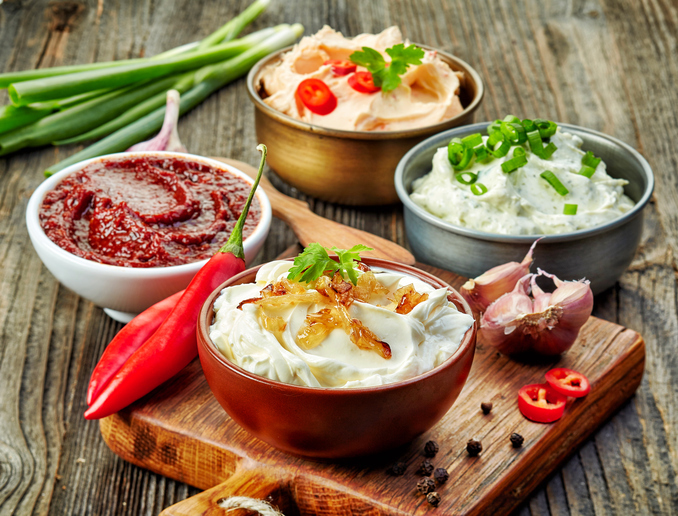 Popular dips include guacamole and sour cream with chives. Here’s a commercial with suggestions of things you can dip in hummus. To dip also means ‘to put animals (usually sheep) in a solution that contains pesticides’ and the dip is that solution. The related noun dipper means something that you dip into a liquid to scoop some of it up, like a ladle (ie, a deep spoon for serving soup). Because of this, in US English, the Big Dipper is the name of the star constellation more formally known as Ursa Major (in UK English, we call it the Plough). Dip, as a verb, dates back to before the year 1000. The Old English dyppan, meaning ‘to immerse’ or ‘to baptize by immersion,’ became the Middle English dippen. It maintains its main sense, ‘to immerse (in liquid),’ to this day, despite losing its relation to baptism. It is related to the German taufen (to baptize), and probably also to the English adjective deep. The noun dates back to the late 16th century, and comes from the noun. The meaning of ‘downward slope or movement’ is from the early 18th century, while the food sense (a sweet sauce for pudding, and later a savory sauce for appetizers) is from the 19th century. As slang for a foolish person, it was first used in the 1920s in the US.